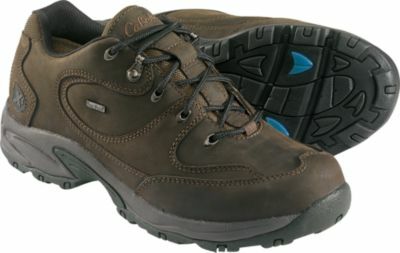 A sturdy general purpose low hiking shoe. Surprisingly wearable considering their firmness. Great support, deep and durable treads, and reliable waterproofness make this a consistent favorite for all kinds of trails. Might be my all-time favorite low hiker. 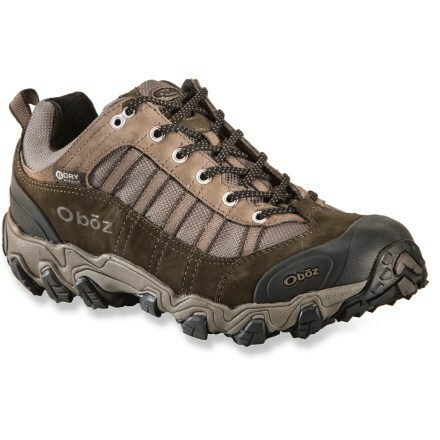 The Bridger Low is the most sturdy and heavy low hiking shoe that Oboz sells. My size 12 pair weighs 2 pounds 6 ounces. They come in two muted color schemes—tan/brown that they call "walnut" and darker/lighter gray that they call "dark shadow." My pair is gray. The upper part is all leather—a soft, smooth, nubuck leather that doesn't need much if any time to break in; the tongue is a combination of leather and mesh/synthetic. The shoes have Oboz's standard and above-average insole, which I replace with custom orthotics. Good speed lacing is always helpful on a solid shoe. I like that the top couple of lacing eyes are metal; the rest are fabric. Note the rubber toe cab, which helps a lot with durability. 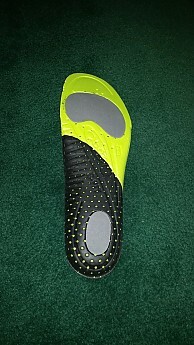 This shows the two different kinds of foam used for the insole; the black part is hard plastic, roughly similar to what you get with a pair of Superfeet. The midsole is moderately forgiving EVA foam, with a nylon shank between the midsole and sole; the Bridger's sole has reasonably deep treads. 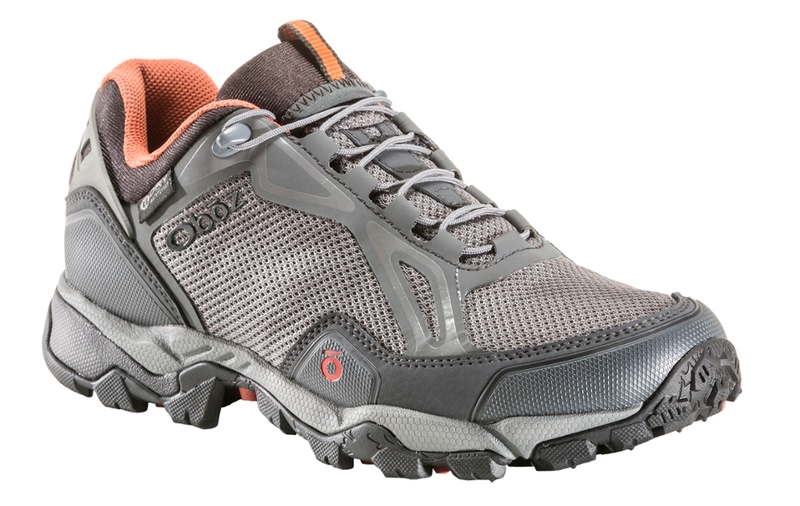 This is a fully waterproof shoe that has Oboz's proprietary BDry membrane. I can wear the Bridger Low with either a medium/light or medium/heavy sock; they fit better for me with the heavier boot socks. The shoe has an average width at the rear and a somewhat wider than average forefoot. With the stock insole, it's good for someone with low to average arches. They are very easy to lace up tight, and I'm very happy to say that these laces, reasonably well-knotted, do not have a habit of coming undone. Full but soft leather translates into a reasonably firm-fitting shoe—definitely more so than low hikers with big panels of mesh. Once I'm laced in, I have had no issues with my feet sliding forward on downhills. That's a plus. The photo above was taken inside after a rainy hike. Excellent support both side-to-side and back-to-front. Unless you lace them up loosely, don't expect your feet to move around in the shoe at all. The midsole isn't the hardest or most firm material I have worn, but I think this shoe benefits form having a nylon shank that makes it feel solid under your feet. 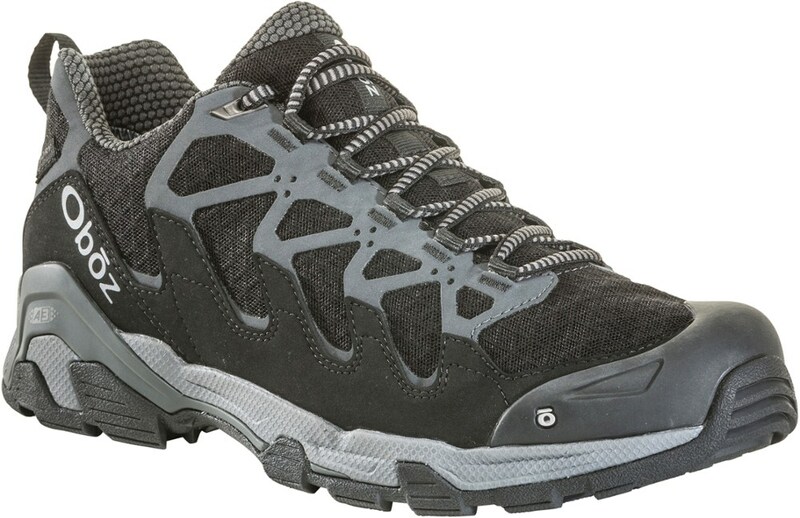 I'm comfortable wearing this shoe carrying 30 pounds or more; my feet don't feel as tired in these as they do carrying similar loads with lighter-weight low hikers or approach shoes. 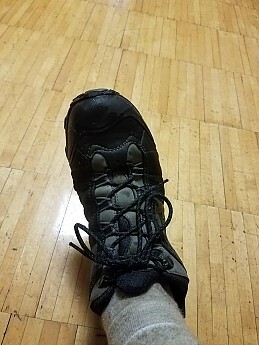 These also do a somewhat better job protecting your feet from rocks and roots than the average comparable shoe, thanks to a hard rubber toe cap and the shank. It's one of the most comfortable shoes I have to walk in all day, so I find that I don't just use them for hiking. If I have family in town and expect to be on my feet in a museum, or for casual Fridays at work, this is often my shoe of choice. 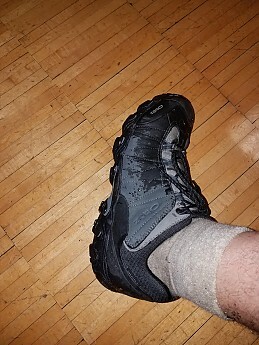 I don't know where Oboz came up with its waterproof/breathable membrane for its boots, but I like it a lot, and it works. Water doesn't get in. 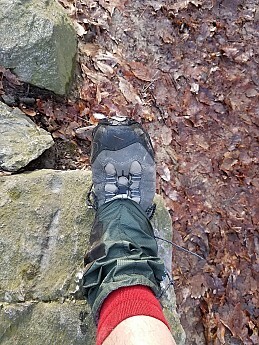 The membrane doesn't fail (unlike a competitor I have tried in other boots), even with quite a bit of use. 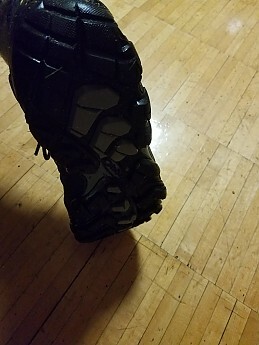 The leather parts of the shoe don't shed water unless you treat them with a water repellant like Nikwax; after about six months, I pump-sprayed them, and water beads up nicely. 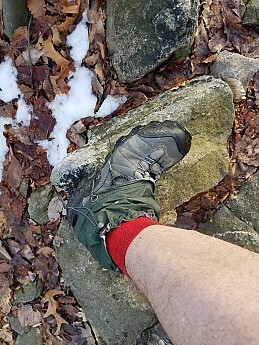 Wearing low hikers with a pair of short gaiters can help keep debris and stones out of your shoes. Consistent with what you would expect for an all leather shoe, the Bridger Low's breathability is limited. I have not experienced any problems with that, but I tend to wear them with thicker merino wool socks that already do an excellent job keeping moisture away from your feet. If you place a very high priority on breathability, you probably want a lighter shoe that doesn't have the waterproof/breathable membrane. 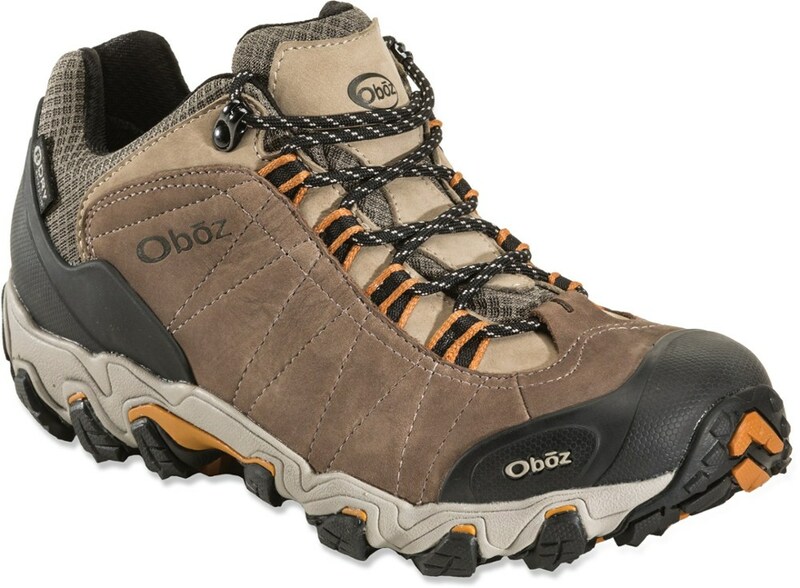 It is worth mentioning that I have had Goretex membranes in other shoes fail within a year of purchase; this is my second pair of Oboz waterproof hikers, and I have not experienced any failure. The treads should speak for themselves. The pattern is unique to Oboz as far as I can tell. They are reasonably deep, varied, and do a nice job gripping on rocks, in crumbly rocks, and obviously on dirt. The rubber Oboz uses on these treads is on the hard side. On one hand, that makes them one of the longest and hardest-wearing soles around, short of a standard Vibram Montagna block sole you would find on high end leather boots. On the other, harder rubber isn't quite as good at providing traction on steep or smooth rocks. 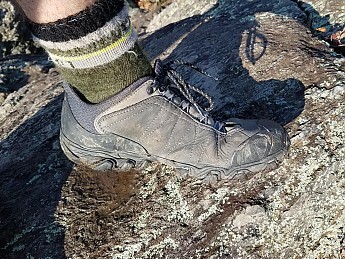 If you place a very high premium on traction in rocky areas, if you like to scramble a lot, think about a shoe that has a softer/grippier rubber sole, like some trail runners or approach shoes. Outstanding, a big plus. 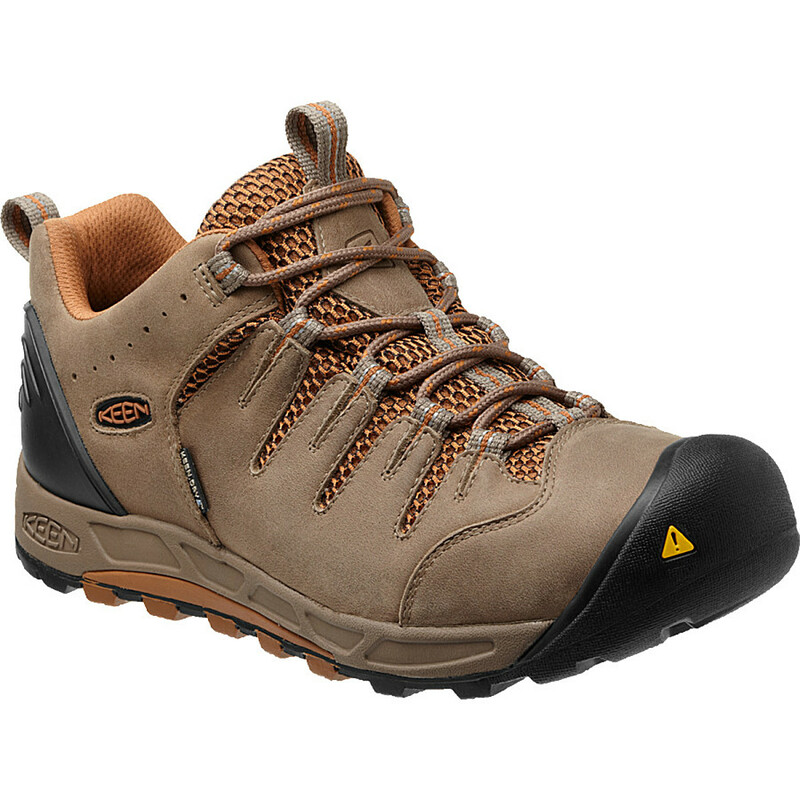 Between the harder-wearing sole, relatively firm midsole, the toe cap that protects the front, and the all leather uppers, you can expect to wear these for much longer than the average low hiking shoe. I have worn these shoes a lot for over a year. Trails in our area range from gravel and dirt to smooth rocks to rough and jagged, particularly in the Shenandoahs in Virginia. While I have not specifically tracked mileage, it's fair to say I have worn them for at least 200 miles. The leather is scuffed in some spots, and there are some points of minor wear on the soles. Oboz is a brand that does not seem to get as much publicity as some of the more well-known options, but they are reasonably widely available via REI and other outlets, and I have been consistently impressed with their design and quality. I like this shoe even better than the Bridger Mid, which I reviewed a while back. I would buy another pair of these in a heartbeat...but they last a long time, so I probably won't need to replace them for at least a year or more. Great review! 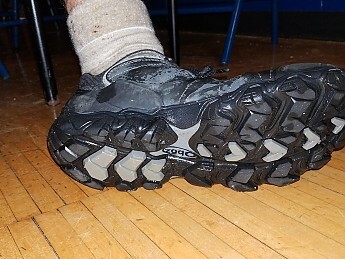 If they make them in wide I may look for a pair to complement my Sawtooth Low hikers. The soft upper and comfortable insole required virtually no break-in period. The aggressive sole is great for light snow and rough terrain. 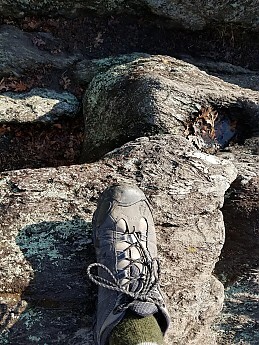 I purchased this shoe because I needed a local hiker because my Merrells wore out after several years of hard use. 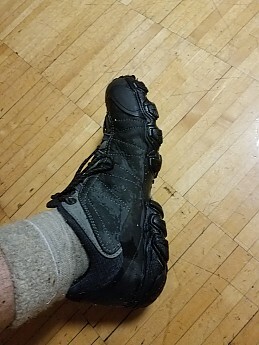 I found these at an REI Garage Sale and at 75% off, and with their initial fit feeling very good, I took a flyer on them. What a home run!!! The soft upper and comfortable insole required virtually no break-in period. The aggressive sole is great for light snow and rough terrain. I'll be hard pressed to go back to Merrell! Welcome to Trailspace, Andrew! Thanks for sharing your first review. I hope you'll keep us posted on how the Oboz shoes work out for you. Nice find, Andrew. Welcome to Trailspace.